William Koch is a lesser known member of the infamous Koch clan of chemicals moguls, though he still ranks as number 392 on Forbes‘s list of the world’s billionaires with an estimated net worth of $4 billion. This weekend, he got some press of his own, however, with an interview on ABC’s “20/20″ in which he admitted to being a “pigeon, a sucker…whatever you want to call it” for having spent millions of dollars—yes, millions of dollars—on fake wine. Perhaps you thought that the Koch Brothers were soulless wannabe aristocrats? Think again. At one point during the segment, Koch actually breaks into tears over his passion for rare wine. Titled “To Catch a Fake,” the “20/20″ piece reported on the impending sentencing of Rudy Kurniawan, an Indonesian wine merchant who was based in Bel-Air, California. Known for his lavish lifestyle—he hung with (totally random) celebs like Jackie Chan, Lionel Richie, and Will Smith—Kurniawan earned tens of millions of dollars fleecing wealthy buyers, and the report details how he manufactured the puportedly rare, decades- and centuries-old wines in the “counterfeit kitchen” of his suburban home by soaking labels off bottles, printing up new ones that sported much-coveted names like Chateau Petrus Pomerol, and then filling them with combinations of cheap wine from other bottles. 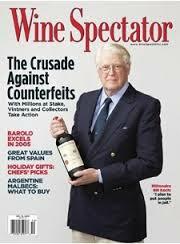 Koch’s fake wine woes—and the catalyst for his suspicions about Kurniawan bottles—were chronicled in Benjamin Wallace’s fascinating 2008 book The Billionaire’s Vinegar which told the story of “The Mystery of the World’s Most Expensive Bottle of Wine.” In 1985, at an auction in Christie’s London, the Forbes family was the buyer of a bottle of what was purportedly a 1787 Chateau Lafitte (now spelled Lafite) found in a cellar in France with an elaborate story concocted and sold alongside it that the bottle had been owned by Thomas Jefferson. The Forbes family paid $156,000 for the bottle after a heated bidding war with top wine collectors including Marvin Shanken, the man behind Wine Spectator magazine. In 1988, Koch bought four bottles with the same back story. When doubts and rumors about the wines being fake hit a crescendo several years later, it was Koch who doggedly pursued scientific analysis that ultimately showed they were created by a German forger. Koch had paid more than $100,000 per bottle. Those prices may seem exorbitant, but the global auction market for fine and vintage wines is enormous, and totaled $337 million in sales in 2013.